Product information "Smart Camera S50, color"
Belonging to the wide range of Tattile’s products dedicated to Machine Vision, S200 is a Smart Camera designed for applications in the most diverse industrial sectors including pharmaceuticals, semiconductors, 2D & 3D analysis. It is equipped with powerful Image Processing architecture, with a Dual Core processor and an FPGA up to 85 K elements. S-Series cameras are characterized by highly sophisticated technology contained in a product of extremely limited dimensions. 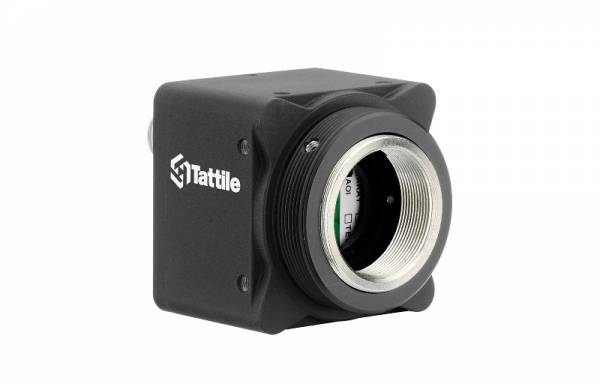 Tattile Smart Cameras are a “All in One” product: in the camera body there is a CPU that processes data, captures images, performs the check-ups required by the application, sends the results to the user’s machine and an FPGA with free space for user algorithms integration. This unique combination of sensor and process architecture allows to obtain on-board image processing at extremely high FPS: up to 180 fps at 4Mpx resolution. Related links to "Smart Camera S50, color"
Product Details "Smart Camera S50, color"